That time of year is fast approaching again when businesses close down for a while around the Christmas period. Time to do some maintenance on those hard workers that sometimes run 24/7 – your PC’s A little bit of maintenance beforehand may save you hart ache when you get back ready and refreshed in the new year! Also – like your beloved pets – SERVERS don’t like it when you turn off the air-con, close the door and hang up the sign “Closed over the Christmas period” – I’ve walked into closed offices only to hear fans screaming in the computers /servers and 42+ Degrees. 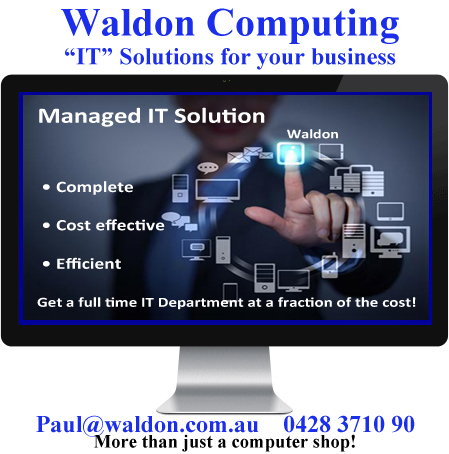 Give us a ring at Waldon Computing for a bit of forward planning & maintenance and have a great holiday break!